The famous London Ferris wheel that is seen from different points of the city is known as the London Eye or as a Millennium Wheel and represents a ferris wheel, with capsules turned into lookouts, reaching up to 135 meters Tall. The London Eye is located in the Lambeth district, right next to the Westminster Bridge and on the banks of the River Thames. Right next to you find the London Aquarium (Sea Life London Aquarium) that you can visit if you go with children and with enough time. The construction of one of the three most famous water wheels in the world took place over seven years and many engineers and architects collaborated in its completion. Once built there were certain problems with the owners of the land who decided to demand an excessive rent sum that led to the idea of ​​closing the attraction. For that reason, the city council of London saw itself in the obligation to intervene and after the clarification of the dispute in a court, a lease contract was signed. Subsequently, the Tussauds Group took 100% ownership of the London Eye and there was no need to close the attraction at any time. The wheel is made up of 32 capsules that can accommodate 25 people . 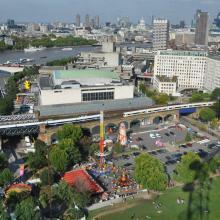 In other words, the full wheel can accommodate 800 people who enjoy the best views of London at the same time. The structural assembly that forms the wheel has a weight of, nothing and nothing less than, 10 tons and is prepared to support the weight of those 800 people mentioned above. All in a safe way so in that sense you do not have to worry about anything. 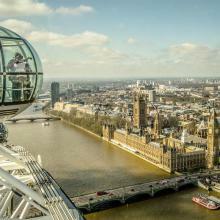 Many tourists go to the London Eye to make their snapshots but few dare to climb for fear of heights. And it is that this wheel was the largest in the world since it was inaugurated in the year 2000 until the year 2006 in which the Star of Nachang (160 meters high) surpassed it, followed by the Singapore Flyer in 2008 (165 meters height). Another point to take into account are the queues so if you would like to get on this impressive attraction the best way to do it is to buy tickets online. Here you can book the ticket without queues that allows you to upload at any time of the day without waiting! For those who want to enjoy a more exclusive experience there is this online offer that includes Champagne and interactive Samsung Galaxy Tab guides. 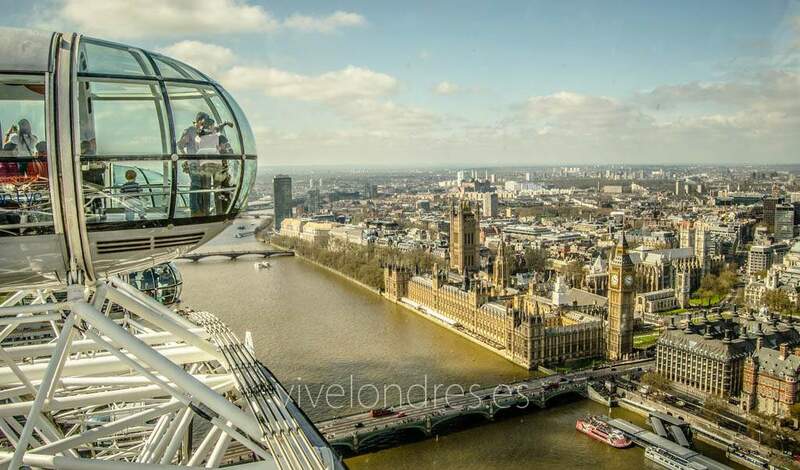 If you decide to climb one of the capsules of the London Eye, you should know that it is not a conventional wheel but the movement is much slower and stops are made so that tourists can make their pictures without distortion. In addition, each capsule will stop at the highest position on the wheel for at least 5 minutes. 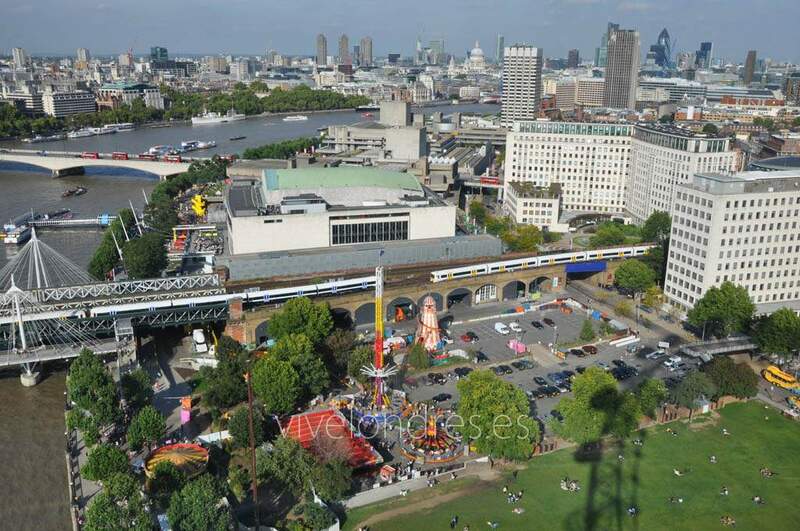 Tickets to go to the London Eye can be purchased at the ticket office of the Ferris wheel but it is best to book online to save queues and take advantage of some offers (such as the links I mentioned in the previous paragraph). Another good option is to buy a tourist pack via internet. Thus, you can get a cheaper price to climb the Ferris wheel and enter, for example, Madame Tussauds wax museum, among many other different packs. On the other hand, if you decide to buy the ticket at the box office you will pay a price of 20 pounds per person. To avoid the long lines of this attraction I personally recommend buying the ticket without queues sold here online. You will save time and money, I assure you. When you buy your ticket to go up to the London Eye you have the right to go to the 4D cinema that is right next to the ferris wheel and where you will see a 15 minute mini movie related to the Ferris wheel. Regarding the hours to go up to the London Eye, they are quite extensive and range from 10 in the morning until 8 and a half in the afternoon between September and March. The time is extended until 9 or 9 and a half of the night between the months of April and August.